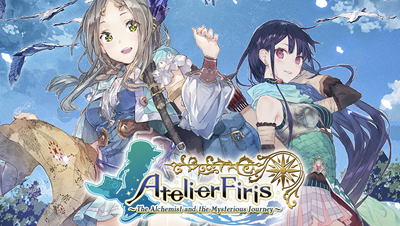 If you’ve been longing for an alchemist simulator, then Atelier Firis has your back. Well, sort of. It’s less about turning base metals into gold, and more about making your own RPG bits and bobs (healing items, weapons, quest items, etc...) rather than finding or buying them. If you’ve been longing for an epic RPG with rich and memorable characters, and a fascinating story where the script drips quality from every syllable... well, keep moving. Nothing to see here. The Atelier games have been going for quite a while now, and this latest entry (theoretically) introduces an open world. Apart from that, though, it’s not an awful lot different to all the others in terms of mechanics and gameplay experience. Your character here is Firis, an overly naive young lady who says “tee hee hee” far too bloody much. After a painfully long setup which involves her starting to learn alchemy, which she then uses to complete bland mini quests set by bland NPCs, she leaves her secluded community for the very first time with her more experienced sister. Let’s talk about the alchemy, because that (as the title suggests) is really what this game is all about. In your pop-up atelier (a sort of portable workshop, a tent with tardis-like properties), there is a cauldron. Interacting with it lets you crack on with your alchemy thang. As the story progresses, and as Firis explores the world more and continues to create more objects, she’ll slowly accumulate a huge list of recipes. These recipes are laid out nice and simply; you can see exactly which ingredients you need, and you can see what you’ll get at the end. You’ll also see what alchemy level you need in order to be able to create it – and you raise this level only by making things in the atelier. Once you have the right ingredients in your virtual hands, the series’ well-established magical cookery system comes into play. You choose your ingredients from the right categories and, very early on, you gain the ability to create using catalysts too. How effective the finished product is – how much health a healing item restores for example, or how much damage a weapon deals – is dictated by a few things. Your alchemy level, your experience creating that specific item... and how you complete the basic puzzle that forms the final part of the process. Each ingredient is represented by a coloured shape, and each catalyst offers a similarly coloured shape template on top of a grid. The basic idea is to match colours and complete lines on the grid best you can for maximum benefit to the finished product. You don’t have to pay attention to this aspect – you can ignore it completely or chuck things down randomly, you’ll never fail a creation attempt – but it’s a simple and important part of the alchemy process that you’d be wise to embrace. The thing is though that, while alchemy has been thoughtfully implemented, the rest of the game is a bit of a mess. It’s full of forgettable characters, dull locales, and Fisher Price My First RPG quests. The turn-based combat system is actually very good, in that it’s clear and user-friendly in a way that the vast majority of JRPGs never achieve. It never really gets interesting though, and enemy design is just as pedestrian as NPC design. Between fights, alchemy and dull quests, you’ll be obsessively picking random crap off the ground like a three year old. This, along with occasionally breaking apart a rock or hitting a tree, is how you get your hands on 99% of your alchemy ingredients. You end up acting (and feeling) less like a heroine and more like a hoover. It doesn’t help that the game can’t decide if it wants to hold your hand, or force you to stumble along the way to progress by accident; mostly sticking to the former while occasionally switching to the latter with absolutely no warning. This is more of a problem than it otherwise might have been because the game’s already boring, and the last thing it needed was a few sprinkles of frustration.